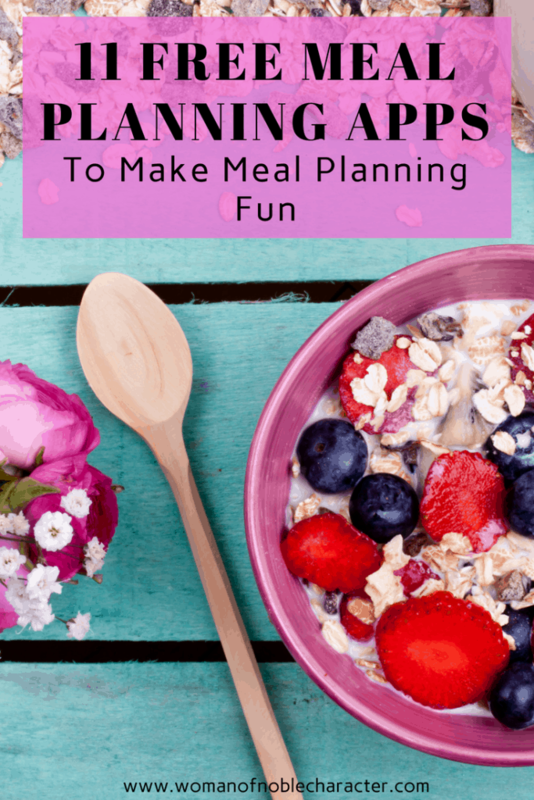 Meal Planning is one of the best ways to save time, money and ensure that your family is eating healthy meals. I meal plan about once a week for the next week to ten days. 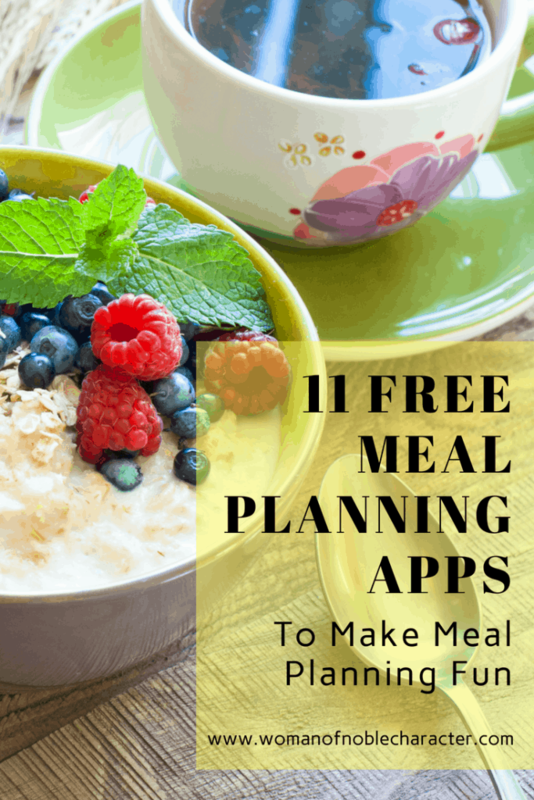 (You can read about my meal planning method, the benefits of meal planning and grab the free meal plan template HERE). But, maybe you would prefer not to handwrite your meal plan or maybe you’d like to meal plan on the go. 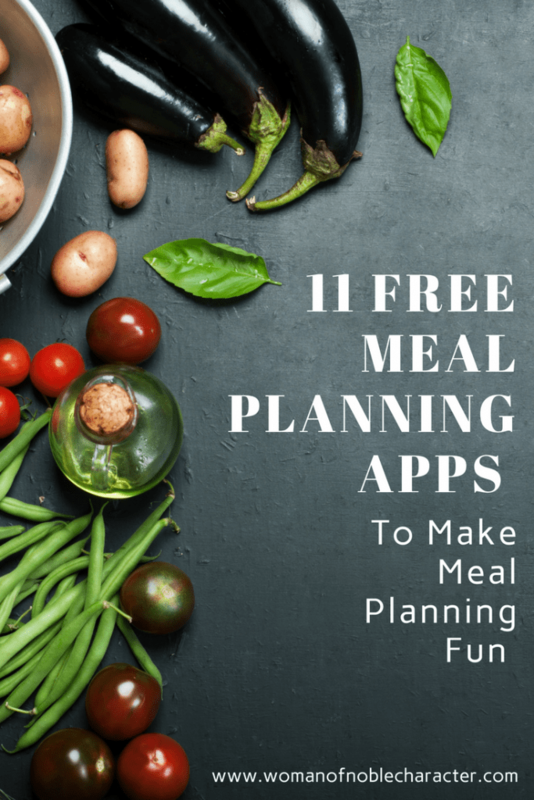 Perhaps, you want to meal plan and bring your shopping list with you on your phone. Or maybe, you’ve got meal planning down, but are looking for more weeknight meal ideas. 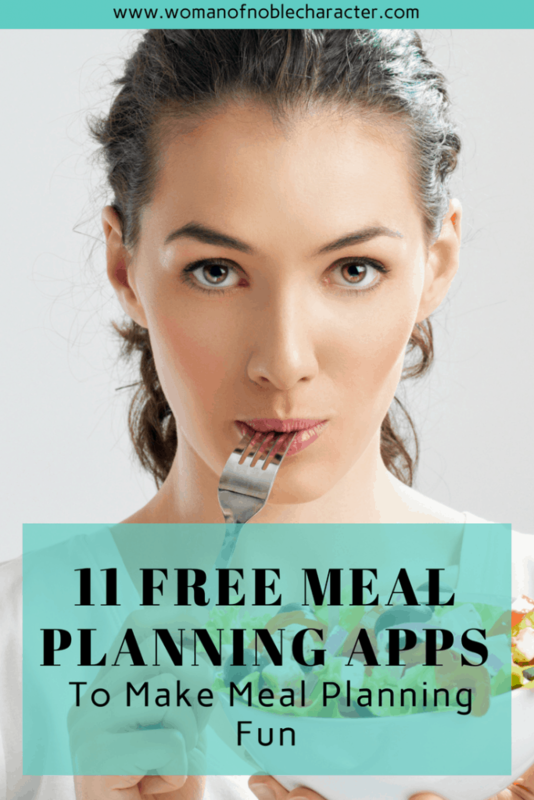 Whatever your motivation, you will love my list of 11 FREE meal planning apps to make meal planning easier. Mealime is designed around planning family or meals for guests the simply. You can create profiles of everyone you are cooking for, their llikes, dislikes, general eating habits, allergies, and mopre. 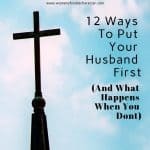 You can also create profiles for couples or whole families to make planning a little easier. Pepperplate is a great way seamlessly manage your recipes, menus and shopping lists on the web, Android Tablet and Android Phone or iPhone. – Take your phone or Tablet into the kitchen and cook your whole menu with multiple cooking timers. – Share your favorite recipes with friends and family via Email, Facebook and Twitter. – Import recipes on Pepperplate.com from your favorite sites. – Combine recipes into menus for dinner party or holiday meal planning. – Organize meals for the week or month by adding menus and recipes to the schedule. – Add to your shopping list on the website, and it automatically syncs to your tablet or phone. – Shopping list is automatically organized to match the order you shop in the grocery store. – Create your own unlimited categories to organize your recipe collection. – Your collection synchronizes automatically from the website and is backed up on your device automatically without connecting to a computer. – Take your entire recipe collection with you to the grocery store or while traveling, no Internet connection required. AnyList. is an app that allows multiple users to add items to one shopping list. Plus, if there are any changes made on the list, everyone’s devices stay up to date to avoid duplicate or accidental purchases.. If you want more features, you can pay for the premium options. With these, you can assign shopping list items to different stores, as well as create location-based reminders. This will stop you from forgetting to pick up an item only available at a certain store next time you’re nearby. • Scroll through step-by-step photo instructions and videos, so that nothing can go wrong when you’re cooking. • Use the practical serving size converter to cook just for yourself or for a larger crowd with ease. • You can like and save your favorite recipes to personal cookbooks, upload your own tasty food photos, and leave feedback, comments, and tips. • Plan your dinner on the go with the practical shopping list generator. You can even export your list to your reminders for a hassle-free shopping experience. • The app is completely FREE of charge! Named a “must-have app” for a better life by The TODAY Show, Cozi Family Organizer enables users to keep their family’s busy schedules organized, synced, and up-to-date. With a shared family calendar and a to-do list feature for tasks like grocery shopping, household chores, and more, Cozi is an essential all-encompassing organizational app for modern families on-the-go. Use it’s easy features to create weekly or monthly meal plans to share with family. No more “what’s for dinner, mom?” – they can look at Cozi and know. BigOven simplifies home cooking for busy families and individuals on the fly. In addition to being a super easy-to-use grocery list organizer, BigOven also comes loaded with over 350,000 recipes and helpful tips for meal planning. Yummly is a general food-sharing and recipe-finding app that features plenty of vivid photos and a rating system to help you find the most popular (or at least the most talked-about) recipes online. If you have your meal routine pretty well down but need some help finding the right recipes, Yummly is a great app, but more low key than other meal planning apps. It is basic, but has a robust selection Yummly Recipes and a great Shopping List version to help you plan out your meals. AllRecipes describes DinnerSpinner as providing “Access your personalized food feed jam packed with trending and seasonal recipes, easily create custom collections to organize and share favorite recipes by theme, and create your personal Cook’s Profile to share favorite recipes with friends, family and other cooks with your same interests.” I use AllRecipes web version and can’t wait to try this foray into their meal planning apps. The “Healthy In A Hurry” is another of the meal planning apps that works across most all devices. It puts delicious, nutritious recipes at your fingertips for any meal – even dessert! Some of the app’s top features include: 200 quick and easy-to-prepare recipes from the EatingWell Test Kitchen, preloaded recipes for instant access, a user-friendly experience with ability to browse by course category and much more. ChefTap has an impressively intuitive built-in grocery list organization tool to make your favorite saved recipes come to life. ChefTap automatically clips recipes from any site and saves them into the app’s permanent archive without any cutting and pasting, highlighting text, or hidden third-party supporting sites involved. ChefTap then helps users create grocery lists based on the specific ingredients used in their favorite archived recipes. The app combines like items on the list, figures out what section of the grocery store each item on the list is located, and sorts the whole list by aisle to save you time and energy in the grocery store. When it’s time to cook, ChefTap displays recipes in a kitchen-tested, easy-to-read format, and it even lets the user adjust the yield for any clipped recipe. Want to save time and money grocery shopping? Check out this post on 17 grocery shopping apps to save you time and money. Prefer to find recipes and meal plan online? See this post on the best sources for weeknight meals. 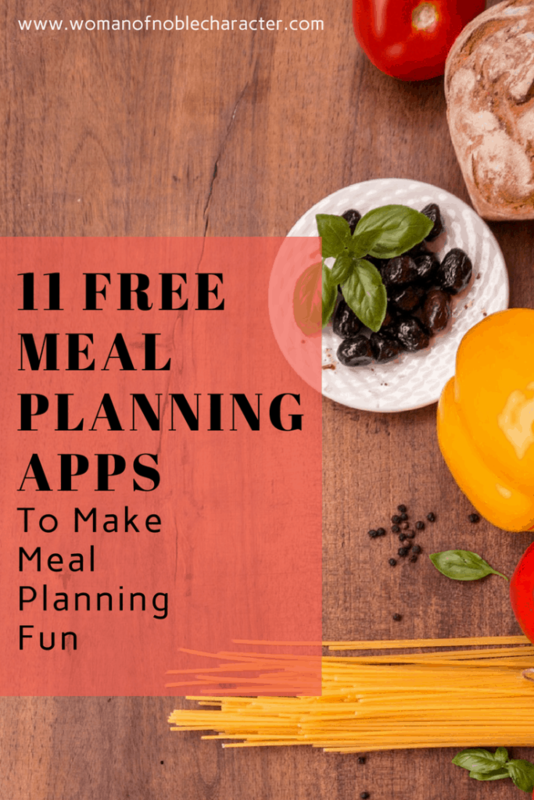 What meal planning apps would you add to this list? Comment below and share the love!